Two posts in two days? You bet – I’m trying to make up for lost time! With fall having officially arrived just a couple days ago, I’ve been decorating for the new season all week. Mostly, I’ve just put up the same candles, lanterns, and decor we’ve had for years. I have a few autumn-related projects on my to-do list, so hopefully I’ll have those completed and can blog about them soon. I did finish one craft this week, and I really wanted to share it with you. 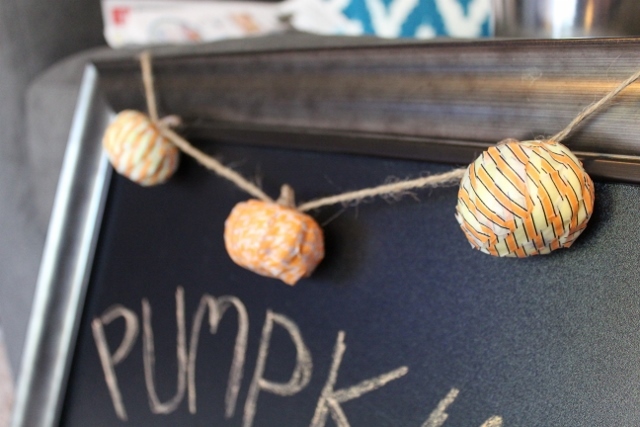 It’s a washi tape pumpkin garland. And the end of fall last year, I picked up a pack of six mini plastic pumpkins from Michael’s. They weren’t the greatest colors, but I thought I could use them for vase filler or maybe paint them (neon pumpkins, anyone?) and display them in a glass vase or something. Cut to this year when I took the bag of pumpkins out of my fall decorations storage tote. I had the idea to turn these cute little guys into a small garland. 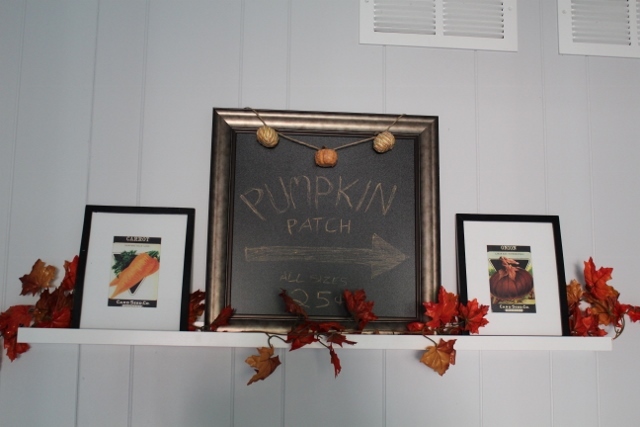 I knew that the six pumpkins would not make a long enough garland for the fireplace, so I thought a shorter garland would look nice paired with a fall print or chalkboard. I still needed to figure out how to pretty the pumpkins up a bit. I didn’t feel like painting them (mostly, I didn’t want to set up cardboard and newspaper outside), so I tried to think of what I had around to change their color and pattern. Maybe decoupage using scrapbook paper? But, my laziness got the best of me when I realized it would be messy. I then got the idea to use washi tape. I have a ton of rolls, and while none were really fall-like, I realized I had some orange options and decided to go for it. 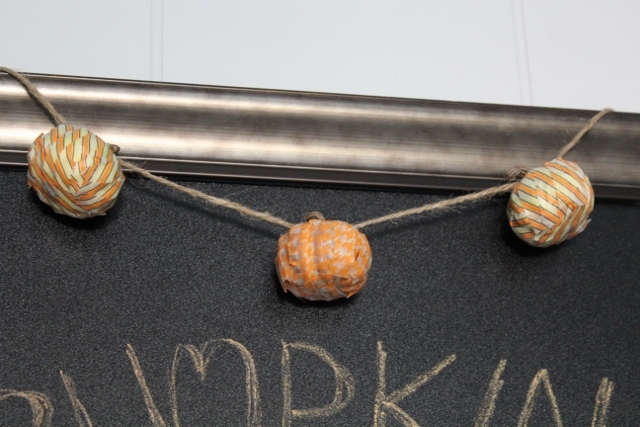 Before I got started taping, I tried figuring out how I would attach the pumpkins to some brown twine. I considered using a hot glue gun, but I wasn’t sure the pumpkins would hang nicely. I thought that cutting off the stem, putting hot glue under it, and then reattaching the stem with the twine underneath would be the best option. When I went to remove the stem, I was pleasantly surprised to see that it popped right off intact! I left the stem off and taped up three of the pumpkins. I used a striped pattern on two of them and a herringbone pattern on the third. I did three continuous loops of washi tape around the pumpkins going right over the middle, and then a loop to the left of center and one to the right. For the part of the pumpkin left showing, I used short pieces of tape vertically on each side of the pumpkin. The tape ended up a little bit over the stem hole, but it didn’t matter. I just put the twine over the stem hole, then re-attached the stem. The garland and framed chalkboard is currently sitting on a floating shelf behind the family room couch, along with some other fall decorations. 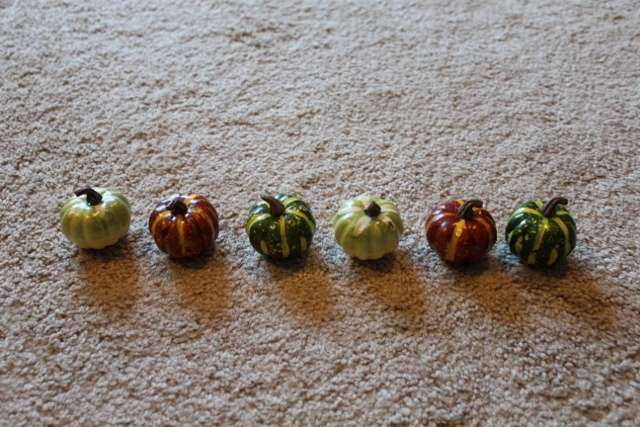 I love how these little pumpkins came out, especially with the little effort this DIY project took to do.